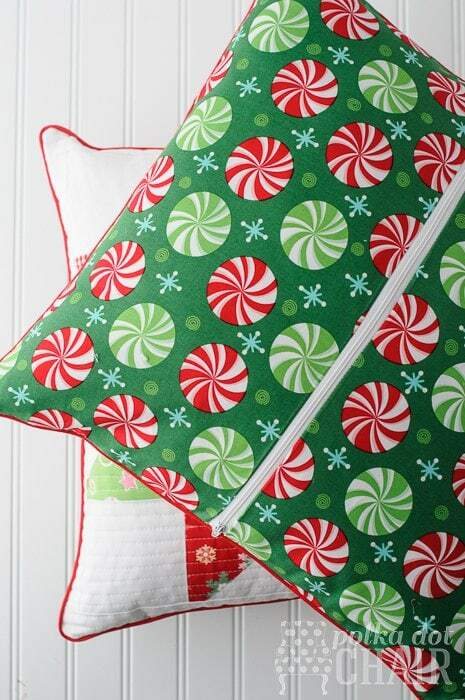 Today I’m going to show you how to adapt ANY pillow pattern to add a zippered back. Do not be afraid of the zipper! 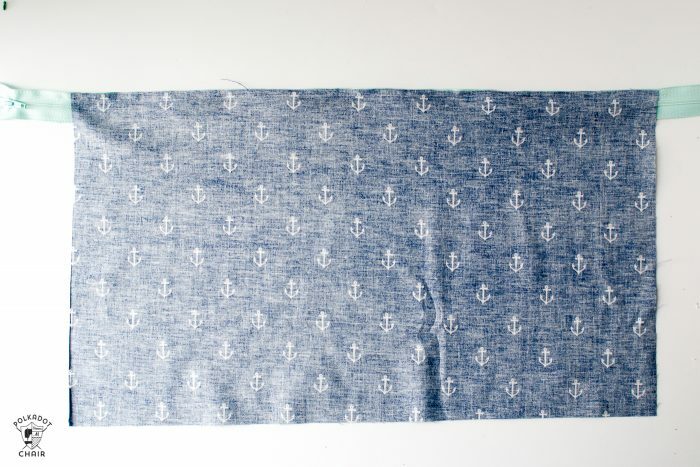 This is a very easy project that is suitable for a beginning seamstress. 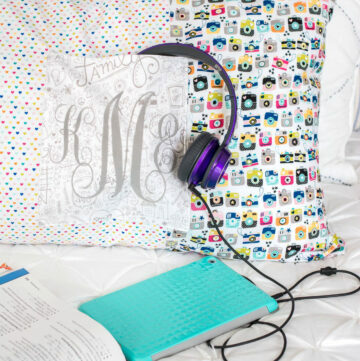 Most of the time when you find pillow tutorials online or in stores, the pillows have a back that is sewn on. This presents a problem if the pillow is one that you think will need to be washed. 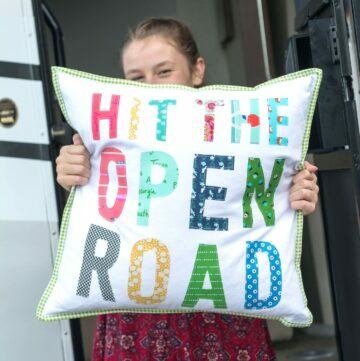 For example, a pillow for a child, like my On the Go Reading Pillow Tutorial. 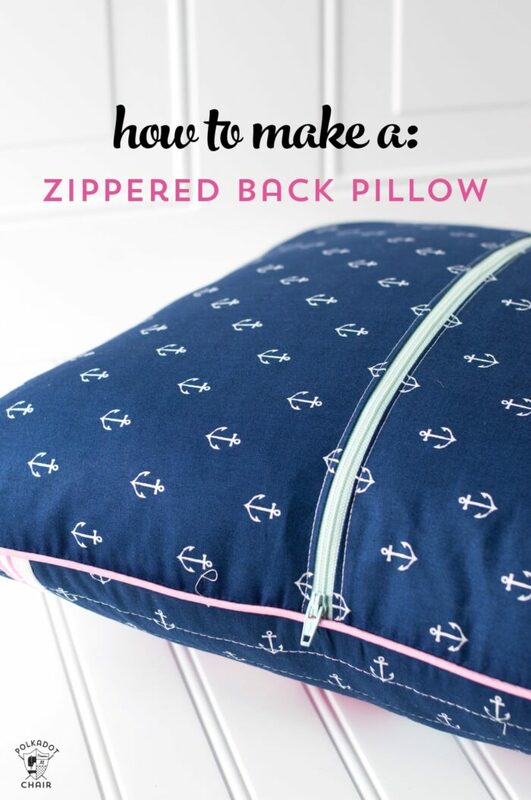 You can easily make a zippered back for ANY size pillow! 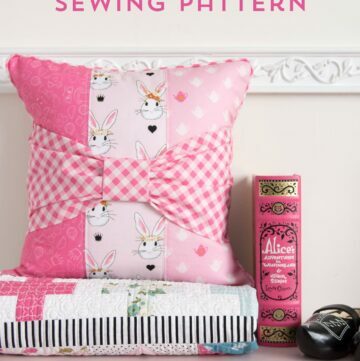 Here is how to size it to your specific pillow, today’s tutorial assumes an 18″ x 18″ pillow form. Take your pillow dimensions and divide by 2. So 18″ /2 = 9″. Add 1″ to this measurement so 10″. 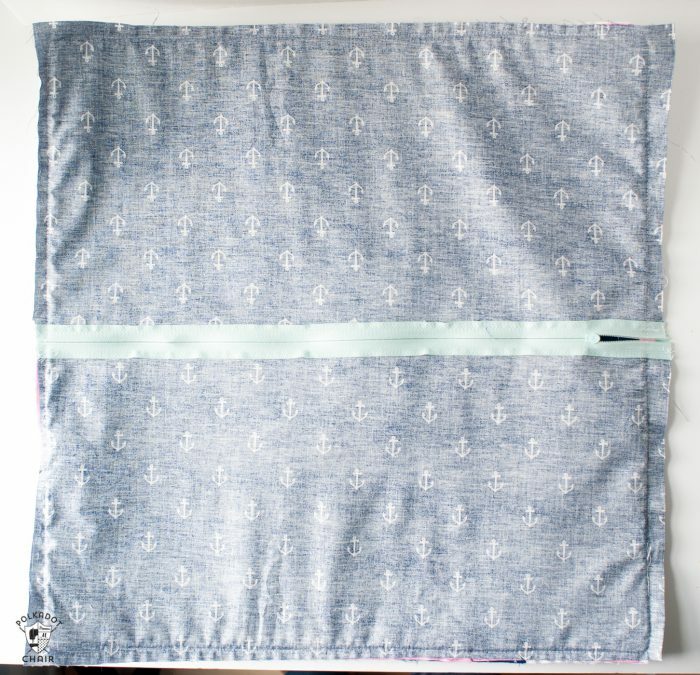 Cut both of your back panel pillow pieces to 10″ x 18″ (the width of your pillow). You can change these up for other pillow sizes! Your zipper can be ANY length as long as it is polyester and LONGER than your pillow width. Center the zipper over one 10ʺ x 18ʺ rectangle of fabric; depending on your zipper size, there will be 1ʺ or more of zipper extending past the ends. 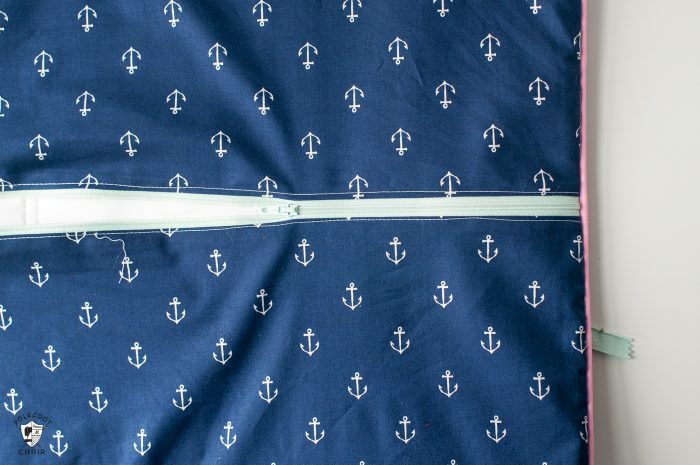 Pin the right side of the fabric to the right side of the zipper; stitch in place. Repeat for the second rectangle and the other side of the zipper. 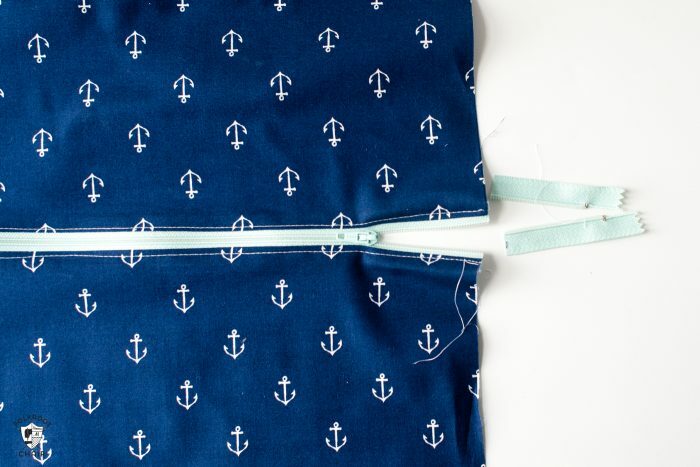 Press the fabric seam allowances away from the zipper. From the right side, edgestitch along the sides of the zipper. Move the zipper pull so that it is in the center of the pillow. Trim the pillow back to 18ʺ square (or whatever size of pillow you are working with), avoiding the zipper. Pin the pillow back to the front, right sides together. If your pillow front has piping attached, attach a piping foot to your machine (you may also be able to use a zipper foot). Stitch the pillow front to the back, sewing over the stitching used to attach the piping. Trim away the excess zipper. Unzip the zipper and turn the pillow right side out. That’s it! Now you have an easy to remove pillow cover! 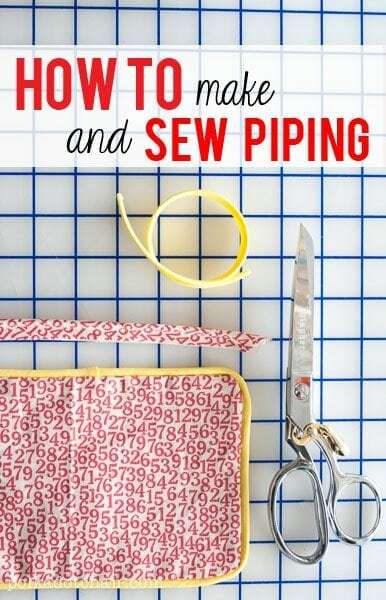 If you’re wondering how I added the piping to the pillow front, then you can follow this tutorial teaching you How to Sew and work with Piping!